I put the last stitch in the binding of my Seville quilt yesterday afternoon. I'm not usually conceited about my quilts, in fact quite the reverse. I have so much to learn about quilting and techniques in general but I'm really proud of this quilt because it challenged me to try a lot of new things for the first time. Among the firsts - I used freezer paper applique, and did free motion quilting. This was also the first time I've used Aurifil thread for quilting and I can honestly say I'm converted. I've been labouring under a misconception that Aurifil was too pricey to use for all my quilting but I went and priced it and it's no dearer than the Gutterman I have favoured in the past. This is not an ad for Aurifil I swear , I'm just so happy with the quality and results I got from their product. I quilted in between all the peels and left the rest of the quilt unquilted - resulting in the peels really standing out with a puffy look. It turned out so much better than I had envisaged. Spotty binding finished it off. Originally I was going to do multi coloured binding but when I was rifling through my stash the spots started screaming "Pick me ! Pick ME!" Who am I to ignore the voices in my head? I used vintage chenille for the back. It's well documented that I adore chenille and it was perfect for this quilt. I'm keeping this quilt for myself and I spent last night snuggled under it. I used wool batting so it's warm and fluffy. All this colour just makes my heart sing. Bonus points for using mostly scraps for the applique peels! This is my first finish from Katy's Finish Along list for this quarter, which leaves me at a loose end. I was faced with a choice between finishing my Holiday Happy Quilt, cutting fabric for my Moroccan Tile quilt, or deciding what to do with the remains of the gingham cushion cover. You can see the original list here. How can I resist playing with these colours since an idea for a quilt just popped into my head the moment I saw them? So it looks like my next project is sorted - something simple and quick but hopefully very beautiful because along with the idea for the next project came a name of someone that I think will love getting this as a gift. Speaking of gifts - It was my Dad's birthday on Saturday. My parents BIG move happened a couple of weeks ago and they are (sort of ) settled into their new house. I am loving having my parents so close to us. Mr. P and I headed up there for lunch and cake Saturday afternoon and then the whole family trooped out for dinner Saturday night as well. Judging by this photo some people never grow up. Happy Birthday Dad. PS.OK my Dad is not a complete freak. Little P was on the opposite side of the table and was massively excited at the cake and the sparklers and my Dad was totally hamming it up for him. And that pile of cream on the cake? Little P did the decorating. I think we can cross cake decorator off his list of future careers. Wow your quilt is gorgeous, well done you!! I can't believe you used chenille on the back of the quilt when you were just starting to free motion - HUGE brownie points for your courage :) If you can quilt with chenille on the back AND do applique then you can do anything! Happy Birthday to your Dad, cake is definitely something to get excited about! Yay on the first finish, loving the puffy orange peels! And, yeah, I don't think I'll be calling Little P come my next birthday. Saying that, it would only be the 2nd birthday cake I'd ever had, but if he'd lay off the cream I might consider it ;o) Happy birthday to your dad! It is gorgeous...You should be really proud of yourself....Well Done! I didn't realise that the Seville quilt had chenille at the back. I'm even more impressed with your FMQ. I have never used it but imagine it would impact (for good or bad) on how easy it is to move the quilt. Oh, your quilt is doubly cuddly with that backing and the puffy parts on the front. MMMM Pretty and puffy... the best of both worlds. Glad to see I'm not the only one whose fabric speaks to them! That's how I work out how to quilt my quilts. I leave the top hanging around where I have to walk past them and wait for them to tell me what to do! Love your finish and your start, who wouldn't love such great colours! Oh that quilt looks soooooo snuggly with the chenille. We could have done with one of those this week, it's been bloody cold here in the mornings. I'm also amazed that you achieved your FMQ goodness with such a backing. I've only done one quilt with minky on the back and that was tricky, I can't imagine what chenille would be like. Now I know where LMS was during the French festival on Sunday - she was facetiming with you!! It's beautiful! Congrats on so many firsts! Great looking quilt and chenille on the back? How wonderful! I think this is one of my favorites! You really did a great job on the quilting for your first FMQ adventure! And a chenille back upped the difficulty factor, I would think. Shay the Conquerer! Bravo! I think Little P. is just getting started. Who knows, he may be on the cusp of a trend, and 20 years from now we'll be like, "Do you believe we actually spread out the frosting back in the day? What a waste of time that was!" Your dad indeed looks very young to match his young-at-heart expression. Happy Birthday, Dad of Pyjamas! 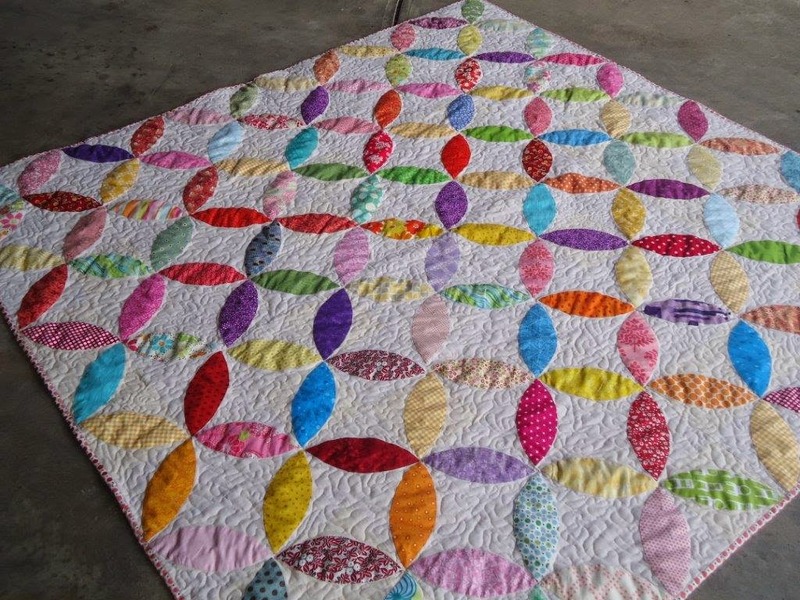 beautiful "peel" quilt - so lively! Well, that is one fabulous finish......I knew you could do it! I'm with you on Aurifil thread too, I've been using it for years. Birthday wishes to Father of Pyjamas! Fantastic finish and hats off to quilting it with a chenille backing which ups the difficulty stakes. I've been a convert of Aurifil for years, though did struggle with thicker weight machine quilting one of my recent projects but I think that was more the fact that my sewing machine is overdue for a service than the thread. I find the big spool lasts for ever and ever. I can so understand why you love this quilt. It's wonderful and you're right about the quilting, it really makes it pop out. Well done. Great idea about your backing too. How lucky to have your parents nearby. It is a real struggle for me to have to keep going up to Hervey Bay. Wish I could just drop in every day or so for a cup of tea instead of having to stay a few days each time. Love the spotty binding. The quilt is gorgeous. Happy birthday to your Dad. Looking forward to seeing what you create from your pretty pile. 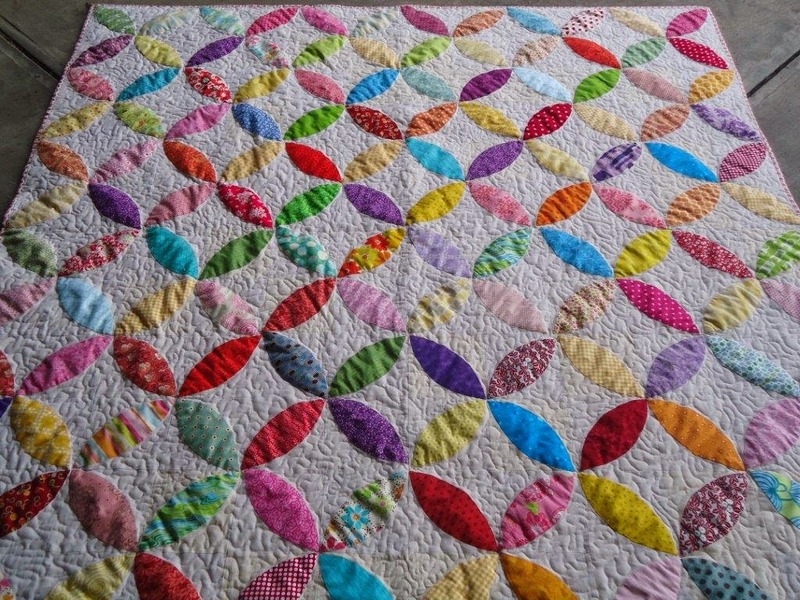 That quilting sure makes the pretty colours pop. All that colour is perfect for the grey days of winter. Awesome quilt Shay, absolutely gorgeous!! Do you use batting as well as chenille? Love the spotty binding!! I wish I could have heard your swearing comp, that is so funny!!! I wonder what the winning words were. Love the photo of your dad!! I bet little P was giggling. Love the expression on your Dad's face! Wonderful finish for you! Lots to feel good about with that one and the bonus--now you get to snuggle under it too. 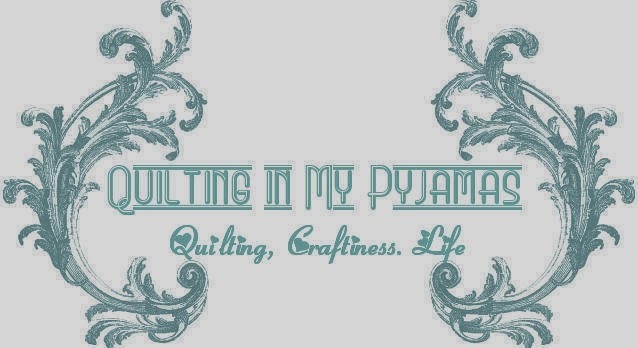 Isn't quilting wonderful? Fabulous quilt. It really turned out beautifully. Despite outing me, i do think Seville looks beautiful. I totally forgot you had used chenille on the back.. It makes it doubly awesome now, first attempt at FMQ with that backing and you nailed it. Happy belated birthday to your dad, all the best people are born in July. I love how your peels turned out! Bright colors aren't in my stash but now I'm thinking they should be! Go you, love the finished quilt, it looks amazing! Love colourful scraps cannot wait to see what you do with them. The quilt is amazing! you did a great job with everything. Happy Birthday Dad!! I didn't think any thing of the face he's making. He just seemed really happy! Absolutely gorgeous! Congrats on the successful finish. Happy belated birthday to your Dad. It's great that he can still get that excited about a birthday. I wouldn't give up on Little P just yet, you never know what skills they pick up as they get older. That quilt is the cat's pyjamas. So great. You deserve a big high five for that one! You are rightly proud of your quilt. I love how stippling makes appliqué leap forward. It's what I was taught in my first learn to quilt lessons. My Dad is a clown with his grandkids too. Just realised your Dad is a great Grandpa! He doesn't look old!